Don't you hate it when you buy curtains that are perfect for your home, but they are too long? It's such a pain to hem curtains, but I figured a way to make it easier. 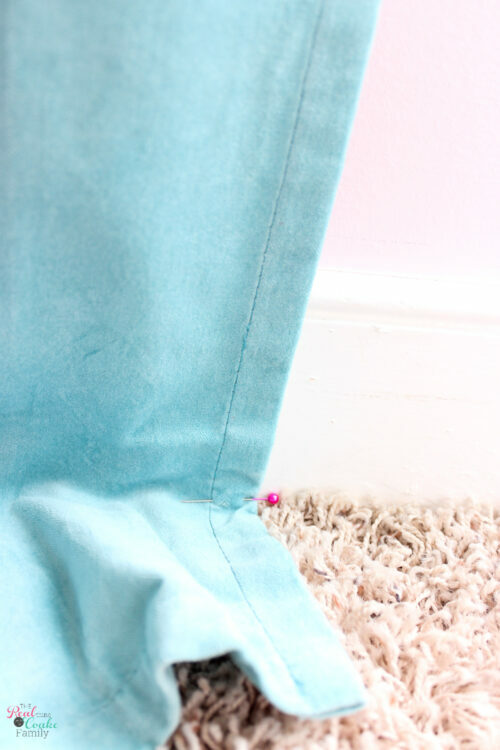 Today, I'm going to show you how to hem curtains the easy way. 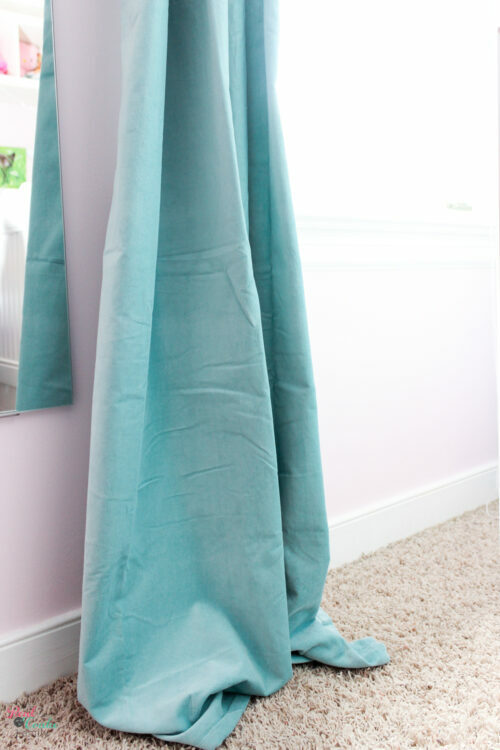 I decided to finally tackle hemming the curtains in my daughter's room and to find a way to get it done in 15 minutes. I like sewing some things, but curtains are not one of those things. I've sewn plenty for the dolls, pillows for the house, and even a bed skirt, but it has been a long time since I've done anything with curtains. I have my curtain battle stories…they never seem to turn out right for me. Let me tell you this is NOT the way a seamstress would hem the curtains, but it works, it's quick, and it still looks good. Perfect mom win! As you can see the curtains from IKEA that are perfect for my daughter's room are too long. 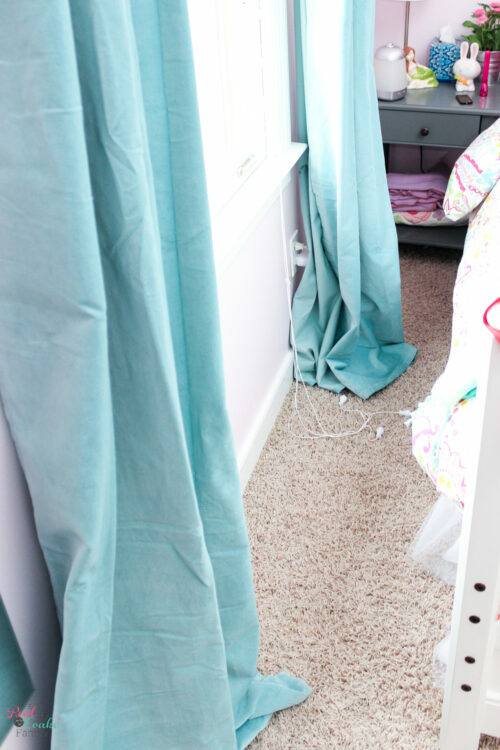 We contemplated leaving them long as that pooled look can be fine as well, but pooled curtains in a kids bedroom is not a great idea, in my opinion. 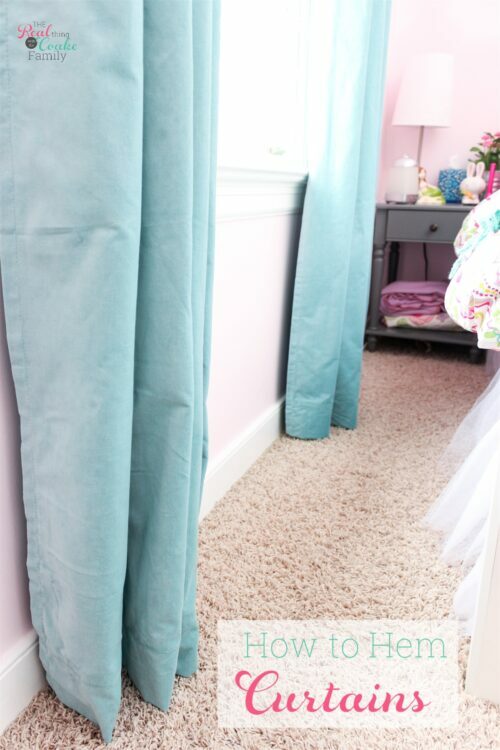 If you haven't already, you need to start by hanging your curtains up on the rod that you plan to leave them on. Gently pull your curtains toward the ground. Don't pull hard, but pull enough to take out the slack. You want to get the slack out, so you can figure out which part of the curtains will hit the ground when the excess fabric is gone. Pin at the spot where the curtains hit the ground. 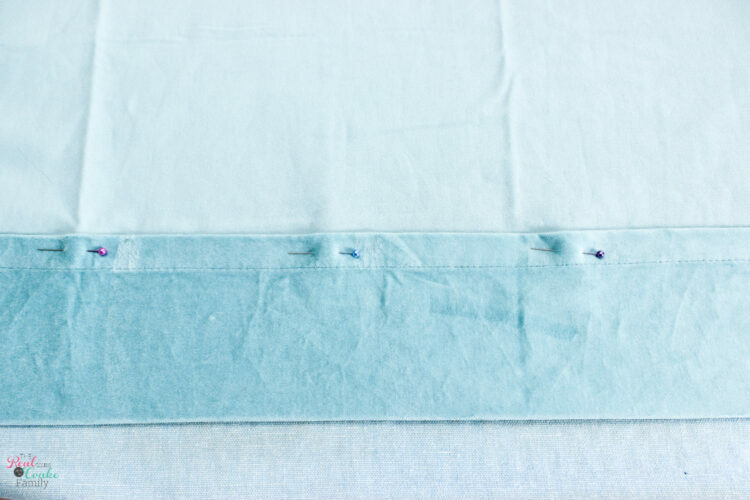 Do this on both sides of each panel you are hemming. If you look at the bottom of the curtains with the pins lined up, you'll see that they are off. This is because the floors aren't level. Most likely your panels will look like this as well. It's OK and doesn't need a professional seamstress or a math degree to solve what to do. Mine ranged from 4.5″ to 3.9″ – I told you we have wonky floors. Split the difference or pick a measurement you think will look nice. In my case, I went with 4.0″. 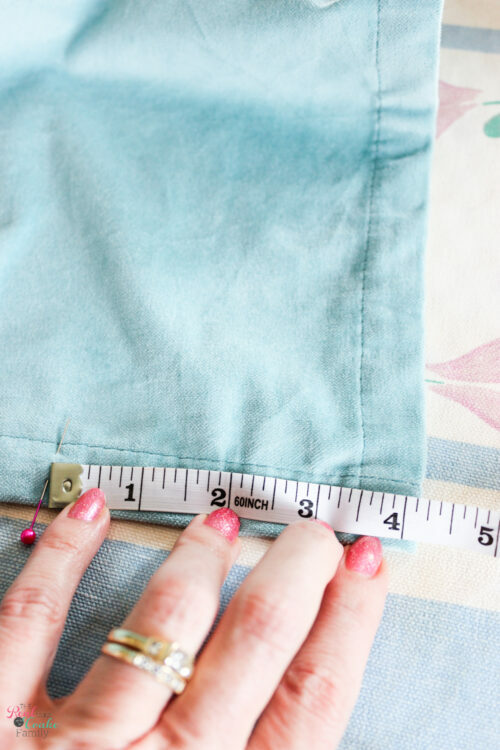 Use your measuring tape to pin the bottom of the curtains at the length you plan to shorten. 4″ in my case. You can cut the extra fabric off, but it isn't necessary and will make the project take longer. Sew the hem. 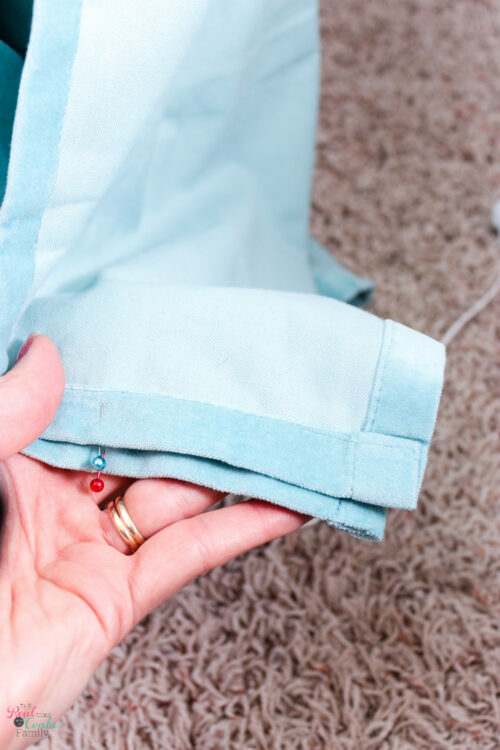 You'll find it easiest to use the original hemline as your guide to get a nice straight line (another bonus for not cutting off the extra fabric). You can sew the ends as well. It's not required, but in my case, I did sew the ends closed. 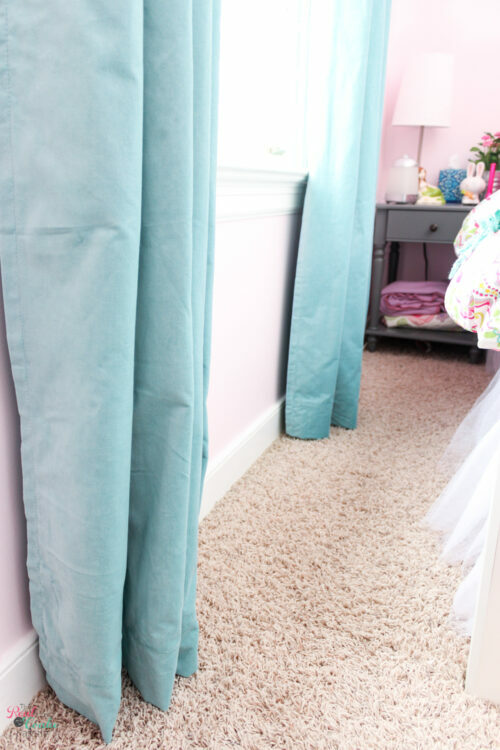 Voila – hemmed curtains in 15 minutes per panel. They look so much better! Hemming curtains can be a more precise process and take more time, but I'm super happy with my quick and easy way to hem them up. They look great. They don't look perfect, but they work for us and I didn't even feel like pulling my hair out while hemming them. It was a win-win for sure! 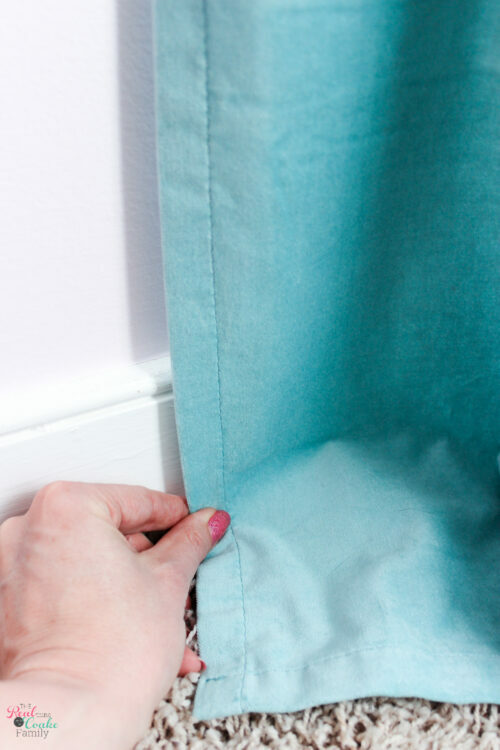 What's your trick on how to hem curtains quickly? Leave a comment below. 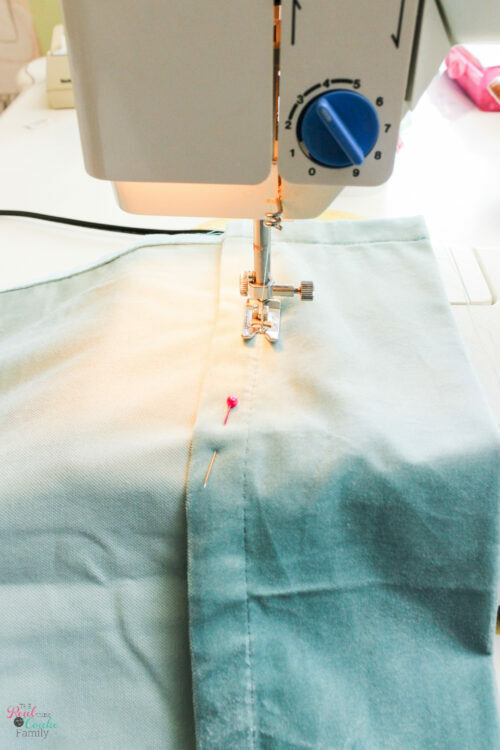 Don't forget to share your curtain hemming success on Instagram and tag me @realcoake. I'd love to see! As a novice I’m confused as to what is meant by “pin on both sides”. Does that mean the right side and the wrong side or something else? 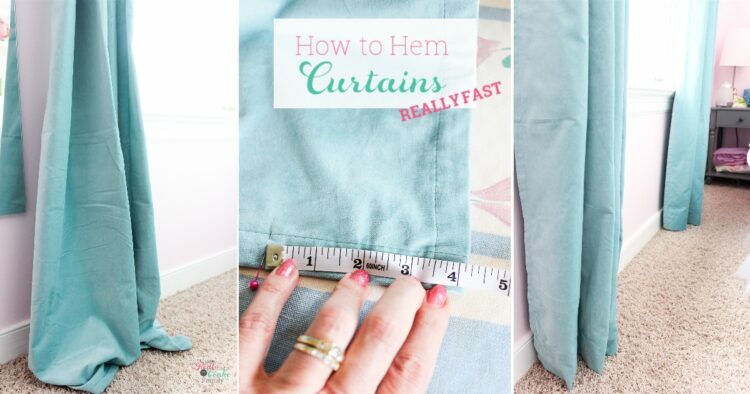 Thank you for sharing a great 15 minute curtain hem. No worries. Thank you for leaving a comment to clarify. Hopefully it will help others as well. I just meant that when you go to pin the curtains, you will want to pin on the right side of the curtain while it is hanging and on the left side of the curtain. If your floors are wonky like mine, you will get pins at different measurements. Then you will have to decide where you want to pin, iron and sew based on those initial pins on the right and left side of the curtain. Does that make more sense? If not, just ask some more questions and I’ll do my best to explain further or in a different way. Take care.